I’ve been to Half Moon Cafe a few times but never blogged about it. Perhaps everyone in Melbourne has already been there, but if not, you should go. They have been voted the best falafel in Melbourne. I agree. They serve Egyptian style falafel, made with broad beans rather than the usual general middle eastern kind made with chickpeas. I love their beautiful green interior. There are several options up on the board for sandwiches or you can pick your own. I went for the Colibaba and subbed out the yoghurt for a tahini dressing. 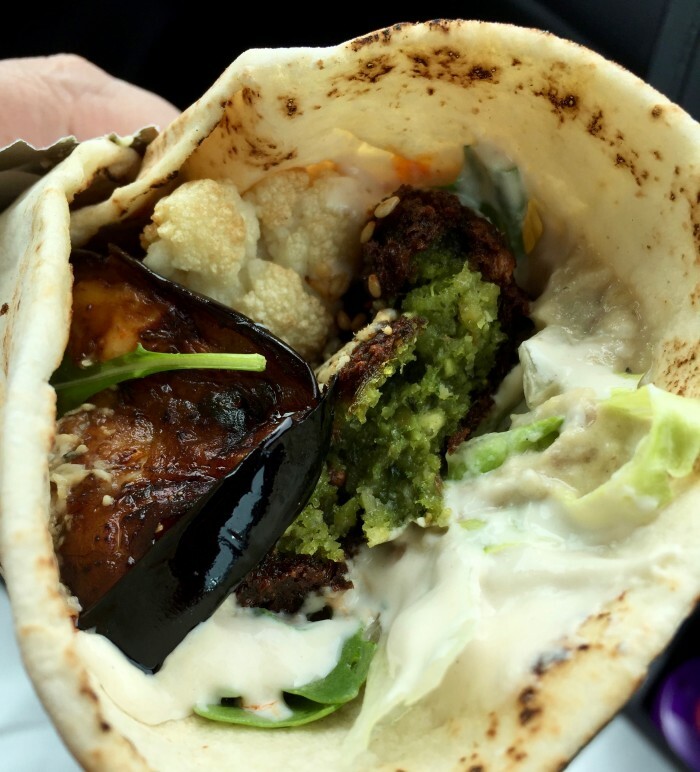 The Colibaba is made up of falafel cooked to order, lettuce, rocket, babaganouj, beautifully fried eggplant slices, fried cauliflower, chilli and tahini sauces wrapped up in flat bread. It is a sensational combination of textures and flavours and I loved it. I don’t think snack food gets any better, and it is a bargain at $8. There are plenty of other vegan or veganisable options available. The shop is tiny, with only a few tables inside, and it is low on ambience, but outside in the mall there are many tables available. It was packed at lunchtime on a public holiday. The worst thing I can say about Half Moon is that they are only open daily until 5! That looks great! I haven’t had a falafel made with broad beans before. The eggplant and cauliflower additions sound perfect.